Even though this summer has been one that our family would like to forget because of a very sad event earlier in July, small pieces of happiness can come from the most random things. For example, when I was asked to interpret a hilarious dream about someone putting fur highlights on a cat into cake form, I could not say no. 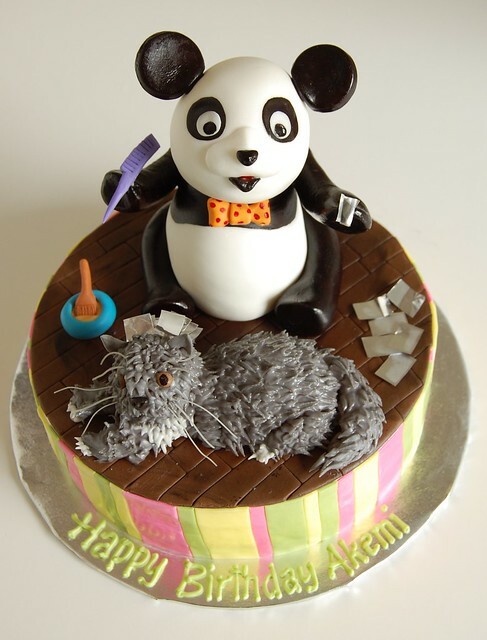 The result was the third appearance by Mr. Panda, a recurrent character on Akemi's multiple birthday cakes over the years. Featured this year is Simba the cat (not our Simba) who is receiving "Back Street Boys highlights" as described by Davis, Akemi's friend who had the crazy dream and ordered the cake. Everything was made of fondant with piped royal icing fur, except the aluminum foil was actual aluminum foil because nothing I had could really reproduce the look of foil (except maybe edible silver leaf but that is too pricey). And whiskers were rice vermicelli noodles. Posted by Charmaine at 2:03 p.m.
August 9, 2012 at 4:20 p.m.
August 9, 2012 at 11:31 p.m.